You may have lost teeth for a variety of reasons. Tooth decay, gum disease, injury, and wear and tear due to severe bruxism (teeth grinding) are just some of the ways in which teeth get damaged. Losing teeth destabilizes your mouth’s structure, causing other teeth to shift and making further tooth loss more likely. Dental implants replace missing teeth by mimicking natural tooth structures, preventing the bone loss and other oral issues that can result from lost teeth. • Dental implants eventually fuse to your jaw bone, making them a more permanent option for tooth replacement that will help prevent bone loss. 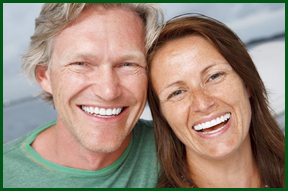 • Implant dentistry offers a conservative option. Dental implants do not require that other teeth surrounding the area be altered before placement, your remaining teeth retain their natural structure. • Dental implants offer better oral hygiene. Because they act just like natural teeth, you can brush and floss them just as you do the rest of your mouth. • With dental implants, you don’t have to use adhesive creams or gels to hold your replacement teeth in place, as you would with dentures. Also, implant dentistry offers more security and stability, preventing slippage that can create embarrassment and discomfort. If you take proper care of your dental implants, you can keep them for the rest of your life. Dr. Rang can place and restore your dental implants, making our office a one stop shop for implant dentistry. Come in today for a consultation and find out if dental implants are the tooth replacement option for you.